As your tenancy comes to a close your landlord will no doubt be looking to replace you with a new tenant. Most likely (s)he will want to offer viewings of the property during your notice period, probably overlapping the end of your time living there. Try to have a professional attitude about these interruptions. Check your rental agreement to find out your landlord’s as well as your own responsibilities for viewings, discuss with your landlords what you think is reasonable, try to keep your home neat and clean and put away valuables during this time. 24 hour up to one week notice period prior to a viewing. Method for notification (in writing, telephone, email, text, etc). Not hearing back from tenant taken or not taken as approval. Ability of tenant to negotiate if a given viewing is not conducive. Landlord or landlord’s agents allowed to conduct viewings. No viewings without landlord or agent present. Whether or not you approve of viewings when you are not home. The need to know, and proof of, who is acting as the landlord’s agent. The hours of the day during which you accept viewings. The days of the week during which you accept viewings. Any specific dates on which viewings can not be accommodated. How long you would expect a viewing to take. What areas of the property you would and would not expect to be viewed. If you prefer no advertising (signs) on the property. If there are extenuating circumstances limiting viewings (new baby, illness, etc). Preferred notification method prior to viewing. While many tenants would not feel that they should go to much extra trouble during a viewing, keeping your home neat and clean during this time period is usually helpful. Not only does it show off your home to the best effect and increase the chances of someone snapping it up (thus, less viewings) but you likely also need to clean your home prior to vacating so you’re not actually putting in extra work anyway. Also, a neat, clean home will be much more likely to show when and where a viewing has taken place making it easier for you to keep tabs on whether or not your landlord is keeping to his or her end of the deal. Though it is a terrible thing to think, you must protect yourself and your possessions during viewings. There is the potential for many strangers to be in your home in a short period of time and there is no real way for you to vet any of them before entering. If possible, gather your most important documents and items and either move them off site or into a locked safe. It may seem extreme, but it’s better to be safe than sorry. Accommodating viewings at the end of your tenancy is not much fun, but it may be something you’ve already agreed to. 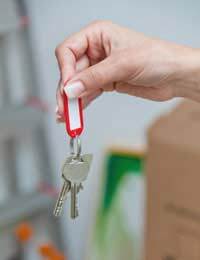 Prior to viewings starting, check on the rights and responsibilities of both yourself and your landlord as per your rental agreement, discuss with your landlord what you consider to be reasonable accommodation of viewings, tidy up around your home and put away your valuables to make sure you are well protected.